Victoria Thoms, Martha Graham. Gender and the Haunting of a Dance Pioneer (Bristol: Intellect, 2013). Martha Graham's legacy is a complex question that can take many forms. Victoria Thoms's book delves into it in penetrating ways. Her monograph takes a (long-awaited, I would say) gender perspective on Graham, analysing her in relation to feminism, UK ballet, film, and queer culture. 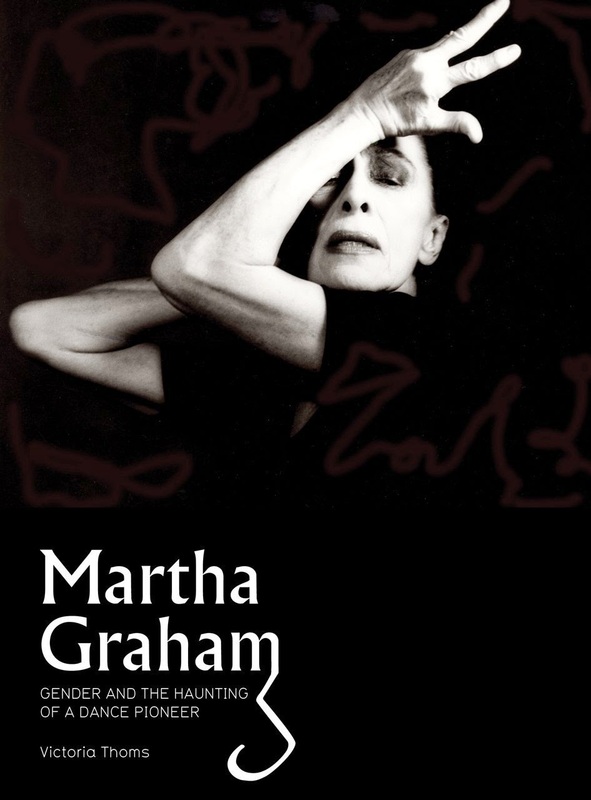 Martha Graham is associated with the interesting concept of ghost not just because as a fundamental presence in dance history is much missed now, but also and most of all, because it is very hard to pin her identity down given the fact that her life and work have been very much shaped by myths nad legends. Thoms skillfully moves inside this ghost-shaped approach to Graham following the above-mentioned four threads, four spectre figurations that lead to a more profound understanding of what Graham's world means today. The first spectre confronting Graham is the spectre of feminism, which is an endurable presence in her work in spite of the fact that she never fully aknowledged it. Thoms investigates Graham's ambivalent relationship with it, analysing her life and statements as well as the women who surronded her, like Frances Wickes and Katharine Cornell, other strong and independent women who could be associated with first wave feminism. As a consequence of that, a masterpiece like Primitive Mysteries dedicated to the Virgin Mary and her female followers, can be seen as the embodiment of a feminist consciousness in Graam's work, "even in the face of (...) [her] refusal". The second spectre is her presence in the UK, a really haunting presence. Graham was neither accepted nor fully understood until the 1970s. In the 1950s, just after the war, it was important for England to rebuild a national identity and Graham's style did not fit into this plan. Ballet did. Margot Fonteyn did. Dance in this context served as a diplomatic tool which showed what each country could offer. And the UK chose ballet, their ballet, in particular Sadler's Wells ballet, which was seen as "a symbol of national pride". As a corollary to this aspect, there is the question of femininity that ballet dancers perfectly embodied, with grace and harmony as its qualities, while Graham's self-assertive heroines and percussive style portrayed a different kind of femininity, one that did not follow standards. The press contributed to shape this idea. For example Paul Holt saw Graham as "an American intellectual" who "put the human body into the most grotesque positions" and Cyril Beaumont said "arm and leg positions are deliberately distorted, steps often begin with the working leg (toe upward) thrust forward, pelvic tilts, constricted thorax and abdomen, and rolling on the floor". The third spectre confronting Graham is film, an art form she engaged with late in her career with documentaries like A Dancer's World and filmed choreographies such as Night Journey. To Thoms, film constitutes a significant medium to study Graham as it "provided a greater mass access to Graham's works, both nationally and internationally". Furthermore, what they give us is Graham's aged body and, on a more general level, a peculiar notion of time, linked to "a sense of immediacy; a feeling of being-threre-ness". In this respct, if compared with photography, film does not leave as much space for the imagination, because the frozen image can let us focus on one single pose and, at the same time, think about what came before and what comes afterwards. The fourth spectre is the least Graham herself would probably expect, as it has to do with queer culture and, more specifically, with two drag performances inspired by her iconic figure, Roy Fialkow's Lamentations of Jane Eyre and Richard Move's Martha@.... The concept of queer is defined as "a positive re-appropriation of pejorative non-normative sexualities and applied to a diverse set of evolving areas of study and activism around lesbian, gay, bisexual and transgendered identities". It is uncanny and particularly suitable to Thoms's discourse, also for the way she then analyses Move's non-drag Bardo, performed by Katherine Crockett, in connection with "queer mourning". The book ends with a reflection on the "ghostly relationship between dance and writing", which requires for us to think in a different manner and go beyond essentialisms. This is a rich and exciting study, a must read for all those interested in cultural history, gender, and dance.